Buy the Ebonite Verdict at PerfactAimBowling.com. Well, here we go. Unless you bowl on a high volume THS, strokers will like this one and anybody with moderate or higher hand will struggle with this ball with out of box surface. But, adjust the surface and you have a heavy hitter. 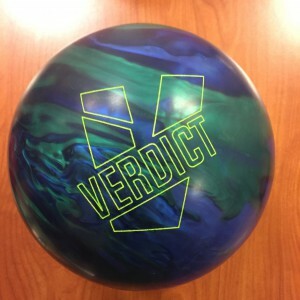 The Ebonite Verdict uses the evolutionary Justice Core wrapped in the new GSV-1 coverstock. The Verdict is a little confounding and I’ll explain why. Out of the box, the ball is simply super strong. My thought was how can I ever use this on a house shot. I did also test this ball at a trade show and it was amazing. So what gives? Before we go further, I must preface that the test shot is not ideal for this ball as it doesn’t have enough volume for the 3 testers. Out of box, the 500/2000 surface really digs in early and the ball has a distinct hook set motion. Due to the aggressive surface, I try to find oil by moving in. But there is a fine line where you need to get deep enough for the ball to be able to get downlane but not so deep that the ball sets and doesn’t make it back. Every bowler saw that characteristic of the ball. It also burns up the shot so you will notice the need to keep chasing in pretty quickly. This test shot just doesn’t offer enough volume to show off the Verdict out of box. I put 4000 and polish by spinner and tested it on a pro anvilane house and shot 248 out of the gate with the Verdict. The surface change definitely made the ball very usable on that shot. I still saw that hook set motion so even with the surface change, you have to keep that in mind. I also tested on a 39ft 22ml sport shot and there were 2 options for the Verdict. Try playing in which really gave too much over under and playing more direct like a short pattern. The latter was the way to go and it looked quite good from there controlling the pattern. CJ who has a higher rev rate and good projection picked the Verdict up and struck immediately. He found the sweet spot quickly but the Verdict does have one. For testing, we tried in and out. It was just way to strong to play more direct. Making a bigger move in also wasn’t ideal as the Verdict again displayed that set motion where it didn’t have energy at the pins. Finally, Sean tested the Verdict. He has the highest rev rate of the testers and again, he saw the same characteristics. The ball reacts over/under for him for the same reasons we described previously. The ball is so strong that he needs room but there is a cliff in terms of how deep he can get before that hook set motion shows up and the ball loses continuation through the pins. He also can’t square up too much as the ball is way to strong in the midlane. I think we said all there is to say about this and it is simply demonstrated in the video. The long and the short of it is that the ball is too strong in out of box for our test shot. While the discussion so far might seem a little tough, I can say for sure that the Ebonite Verdict looks fantastic on the right condition or the right surface. We try to highlight the key nuances of ball motion so you understand the characteristics. Our test shot simply doesn’t have the volume for how strong this ball is in terms of midlane read and cover strength and finish. However, having seen it on 2 other occasions, make an adjustment to the surface and the ball comes alive. It doesn’t change the stand up nature of the core but that small cliff becomes some nice amount of room as the ball now gets down lane. Now the carry is quite good. If you plan on picking one up for THS, be patient. Change the surface on it and you will see just how good the Verdict can be.